Just add a STANDARD size wine bottle. Wine shown for illustration purposes. 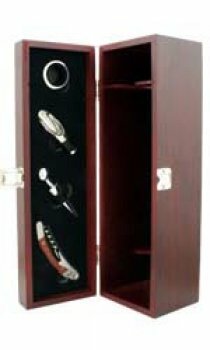 Beautifully crafted wooden case with complimenting stainless steel and polished wooden handle accessories for wine. Accessories comprise pourer, drip-stopper, bottle stopper and waiters friend.